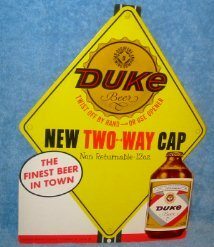 Duke Beer two-way cap; 10 1/2 x 13 1/4 inch die cut cardboard point-of-sale sign with an easel stand on the back. About 1970 vintage. Great shape.